This Real Photo postcard from Bob Schroeder’s collection has a special meaning to him because it shows his grandmother’s house, the same grandmother, Emma Holtzer, from whom he inherited a rich trove of historic photo postcards. Since many of the postcards show scenes in the same vicinity, he speculates that his grandmother may even have taken the photos, then had them printed on special postcard paper backing. This home at 530 20th Avenue was the second home of Alphonse and Emma Holtzer, who moved in about 1919 and remained here for over fifty years. Emma, nee Ferkel, was the great granddaughter of Col. George Davenport. Her father, William, was the son of Davenport’s daughter, Elizabeth, and her husband, Nicholas Ferkel. The postcard is dated 1919, soon after the Holtzers moved in. 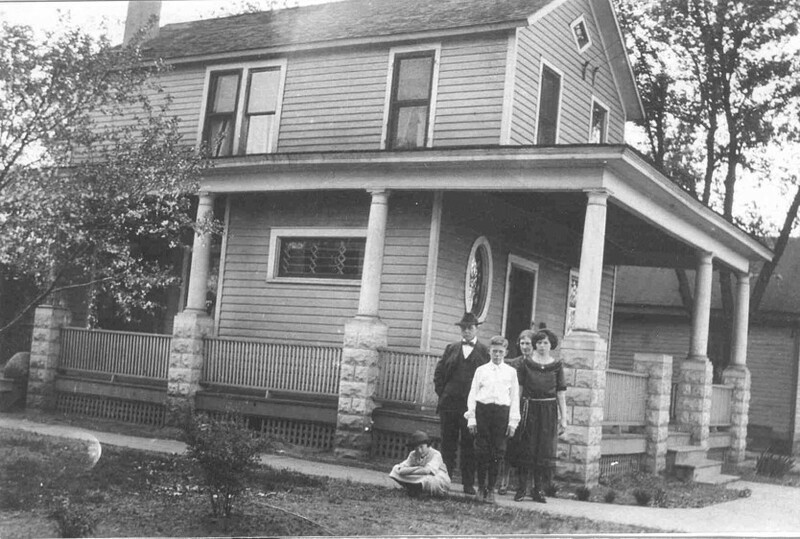 It shows Mr. and Mrs. Holtzer, their son, Harold, and daughter, Dorothy, who would become Bob Schroeder’s mother, as well as an unidentified aunt, all standing beside the front porch. Alphonse, who came to America with his family in 1892, was a painter and decorator during most his working life, working for Paridon in Rock Island and Strecker and Lewis in Davenport. He also served a term as the First Ward Alderman beginning in 1928. Before 1915, the house was outside the city limits and therefore did not conform to Rock Island’s street-numbering system. When it first appeared in City Directories circa 1913 with an address of 594 Michigan Avenue, South Rock Island, it was the home of plumber Walter Grotegut. The home may have been built as early as 1890. By that time, there were already a few houses here, just one block south of the popular county fairgrounds. The clapboard siding, wider than that used between 1900 and 1920, is typical of the period before 1900. There is little other architectural ornament, other than the diamond-shaped attic window and the oval first-floor window, to help date the house. The large wraparound front porch likely dates from about 1910 when big porches were very popular, and the concrete block that supports the round columns was readily available. Leaded panes can be seen in the rectangular window above the family group. Today the house is easily recognized as the one on the postcard, although many changes have been made. Contemporary siding hides the original clapboard and the distinctive attic window, while additions enclose the original open porch. This article by Diane Oestreich is slightly modified from the original, which appeared in the Rock Island Argus and Moline Dispatch on May 7, 2006.